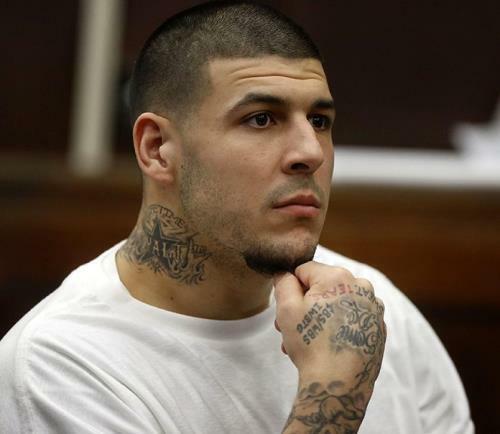 The tragic story of fallen NFL start Aaron Hernandez took another interesting turn with the new revelation of the details of his jail cell after his apparent suicide. ABC News has reported in addition to the Biblical scripture John 3:16 written on his forehead as was reported immediately after his death, Hernandez drew an unfinished pyramid on the cell wall along with the words "ILLUMINATI" written in all capital letters - in blood. Why this was not originally reported one can only ask the Illuminati controlled media. This however clarified one thing we often talk about on this website. That in order to achieve large success you are down with the elite controllers of this world - the Illuminati. Perhaps Aaron fell out out favor and this was the reason for his undoing? You see the elite commit and get away with murder routinely so it's not like he did something unusual Illuminati circles. They have "cleaners" that come clean up bodies and crime scenes and they control the media so it never gets reported. Perhaps he knew he was going to be sacrificed and beat them to it to disallow them gaining power for from it. This is all speculation but one thing is for sure, Aaron was involved with the wrong people and we don't mean the thugs from upbringing.